The Invention of Hugo Cabret SANS PICTURES? I’m beyond excited and apprehensive about seeing Hugo. 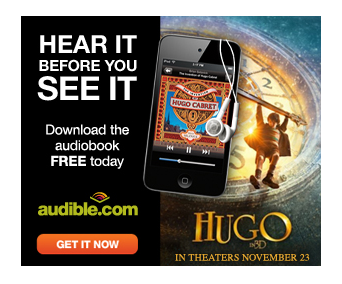 I’m not ready to talk about the movie yet, because it makes my brain hurt (THIS MIGHT BE THE BEST MOVIE EVER, UNLESS IT’S NOT), but there was an ad that popped up on GoodReads that I felt ready to comment on. You probably can guess I’m all about encouraging people to read the book before they see the movie (I made a pretty impassioned speech at the Thanksgiving dinner table yesterday), but I don’t get it. How would this even work? A movie, I get. Especially on a meta level — take a look at this FABULOUS blog post Roger Ebert put together. But an audiobook? Thoughts? Author shannonPosted on November 25, 2011 Categories Book Talks, Caldecotts/Mock Caldecotts, LiteracyTags books into movies, hugo, literacy, reading, the invention of hugo cabret1 Comment on The Invention of Hugo Cabret SANS PICTURES?